i am completely sure that it is a funniest demo on zx ever made. Peppa the Pig listens to grown-up beeper music. On retrospect, the correct grade for this demo would of course have been a piggy. How could I miss that? No Detective Potato but still good! good use of ansi graphics, awesome tune, rocking endpart! A bit slow to start and little bit too monotonous too. However, it all becomes irrelevant at some point because the text is *hilarious*. Simply excellent. Also, very nice emulated text-mode (we do not have any text modes on Spectrum, esp. at this resolution, you know). Music, sync, style, design. Perfect. Nice tune, but so so demo. Great music... I need to show this to my daughter who is a massive Peppa Pig fan. Update: She liked it, favourite part was "when the pig was vomiting"
All I can say is, that this is not far from the original "Animation Quality" of the show. Does not work on firm ZX Spectrum 128 +2 due to timing issues. No thumb up. Ok, have a thumb, i enjoyed it! 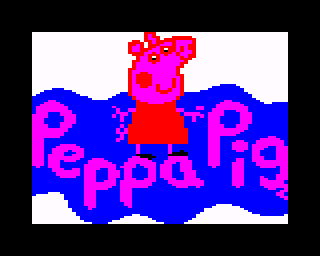 ...eventho i don´t know peppa pig at all ! rulez added on the 2016-05-31 20:24:18 by ɧ4ɾɗվ. Guys? Of course y'all realize this prod is a remix of The Return, right? So how can you not vote it up? Tsk. page created in 0.021043 seconds with 15 queries.